I've been reading food blog after food blog after food blog during this long stretch of down-time at work, and last night my desire to BAKE SOMETHING just bubbled over and I dove in! The diving happened AFTER I realized we only had about half a cup of milk and I needed a cup and then some. So I made a quick run to the grocery store and then I got to diving...or so I thought. After reading about That's the Best Frosting I've Ever Had, I just couldn't take it anymore. I HAD to try this stuff. I love to bake cupcakes and cakes so I needed to know if this was the frosting I'd been searching for. But who wants to make frosting without cupcakes to schmear it on? So I set out to make PW's Best Chocolate Sheet Cake Ever but cupcake-style. However, the stupid grocery store only carried one brand of buttermilk and of course they were ALL OUT. So I had to scrap that recipe and search for another. 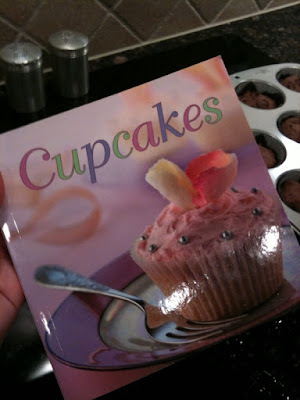 I've started a little collection of cupcake recipe books and made the atrocious error of pulling the wrong one off the shelf last night. My mom had this cookbook at her house and she gave it to me because the printing inside is so very teeny tiny. I still have good eyes and don't need readers to read so I took it. Last night, I flipped to the only chocolate cupcake recipe I could find in said book, squinted my eyes and got close enough to read the instructions and got baking. As I followed the instructions - beat together butter and sugar, gradually add eggs beating well after each addition, then add milk, then fold in chocolate chips (I thought this was weird, but whatevs), then sift in flour and cocoa and VOILA! Batter! 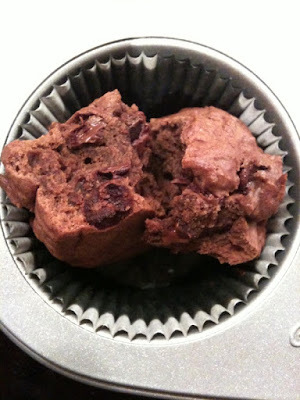 - I quickly noticed this batter was unlike any I'd made before. It was thick and dough-like and definitely not pourable as cake batters generally are. I was frustrated but I kept going. 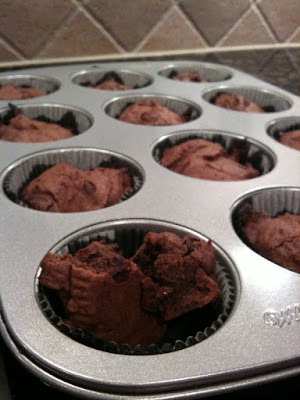 I added a little bit more milk to make it slightly easier to work with and spooned a generous tablespoon of batter into 12 cupcake liners. Even if this was to be a dramatic failure, I was going to see it through to the end. 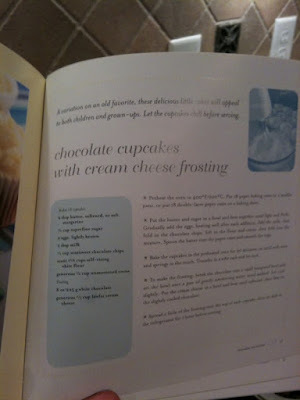 I had a speck of hope that the cupcakes would blossom in the oven and come out tasting spectacular. Eh. You win some, you lose some. These cupcakes came out of the oven as disgusting as they went in (I should've taken a picture of the batter, but I didn't want to get my iPhone all caked up). You can see in the picture how all the butter came out and soaked into the cupcake liner (the dark parts are buttery stains). I even tasted one. They were hot so not at their peak of flavor, but definitely not yum enough to eat a whole one or waste the frosting on. I went over the recipe a million times. The Husband was there, he'll vouch for that. I did it all right. Got all the right amounts of things. It was just a mess. First I wondered if I should've been patient enough to let my eggs come to room temperature. The butter and sugar didn't mix too well with the egg. But I thought that wouldn't really affect the liquidity of the batter. But then, BUT THEN, (and by THEN I mean, this morning) I realized my probable problem. THE FLOUR. I used all-purpose flour instead of self-rising white flour. This didn't even cross my mind last night. I store my flour in my grandmother's antique flour storage canister and it's not labeled anything other than "flour" so...I failed. HOWEVER, even with the right flour, I don't see how that would've changed the consistency of the batter. I definitely see how it would change the outcome of the cakes - um, they would've actually risen instead of becoming the lumps of dried batter they were - but not the plain ole batter. GAH. I saw that best frosting ever post and ignored it....gave up sweets for lent. What did you put the frosting on? Your finger? Usually tastes best that way anyway. Actually, it was a spoon. And it was just as good plain as anything. You must try this frosting after lent!! It's light, but sweet!